A museum, a school, a conference center, and a technology showcase, Discovery World is one of the most interesting and impressive facilities built in the Midwest in recent years. Among other things, it includes two high-definition digital theaters using 18,000-lumen Christie CP2000X projectors, 21- to 27-foot-wide screens, and Crestron C2N-DAP8 surround sound processors. 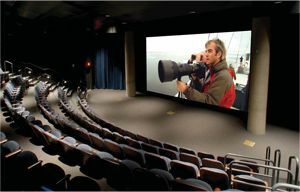 Milwaukee’s Discovery World features two high-definition digital theaters using 18,000-lumen Christie CP2000X projectors and 21- to 27-foot-wide screens. When it came time to choose a surround sound processor for the project, Lewis said he chose Crestron for two reasons. “First, I’m very comfortable with that system. It’s a very solid piece from a strong manufacturer.” The sound systems typically run seven hours a day, six days a week. Lewis needed a processor that would hold up to that type of use for years on end. In the Innovation Theater, the Crestron touchpanel serves as a preview monitor for the various video sources.